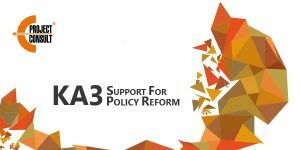 The Key Action 3- Support for policy reform is the third programme set up by the European Commission in favour of innovative policies reform. It provides a financial support which intends to encourage conception of new projects, as regards politic, communication, and diffusion of knowledge in education, training and youth fields. The EACEA is in charge of managing these actions, not subject to annual calls for proposals usually formulated. Initiatives for policy innovation: to deal with policy innovations which aim to develop new policies or to prepare their implementation. Forward-looking cooperation projects :a partner network with a role to identify, test, develop and evaluate new approaches for education, training and youth and contribute to improve them. European policy experimentations :European policy experimentations aim to support transnational cooperation with a view to implement innovative policies under the leadership of high-level public authorities. Furthermore, a cooperation with the civil society is available, in order to help European NGOs and active European networks in education, training and youth to raise participants awareness about European policies, and to increase interaction with public authorities. Analysis and Investigations: collect and analysis of factual elements to enrich knowledge in education, training and youth. Cooperation with international organizations: to facilitate political dialogue with partner countries, and promote international mobility of the European higher learning. Dialogue with involved parties and, promotion of the programme and policies: with public authorities in education, training and youth. Take a look at our previous projects achieved EuroMediterranean Youth Forum and Erasmus+ Caribbean Network.